1. Put all furniture and boxes on the raised platform so we could paint everything around it, and only unpack when we had finished painting. 2. 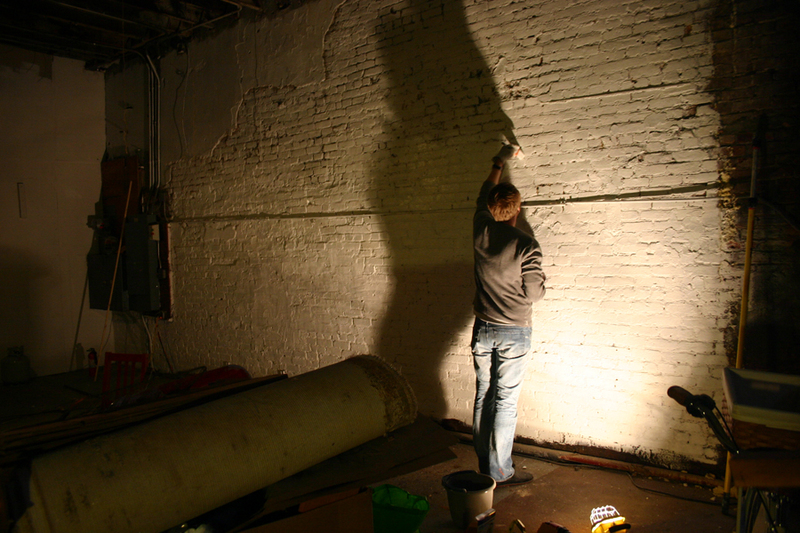 Spend a full 7 days painting the walls and floor with the help of my lovely mother, Joan. 3. 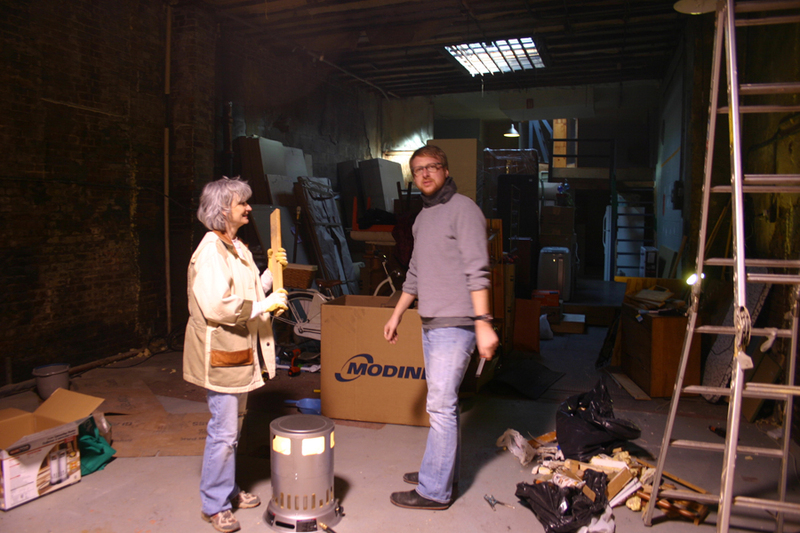 Jeff would start work after those 7 days, Joan would go home to NC and Delia would start to unpack and assemble furniture on her own. It was such a nice and tidy plan…but it was ridiculous and impossible with everything that went wrong. To be brief, there was a funeral, no heat, no light, clogged drains, no hot water, snow drifts INSIDE the building, a leaky roof, a bank account with negative money in it, a car accident, a ticket, another ticket, a tow, a flood, another flood, an electrical failure, a plumber who had more “important” things to do, mysterious water under the kitchen sink, and trash, so much trash that we had to hire someone three times to remove it. So, the original plan failed and we started flying by the seats of our pants. 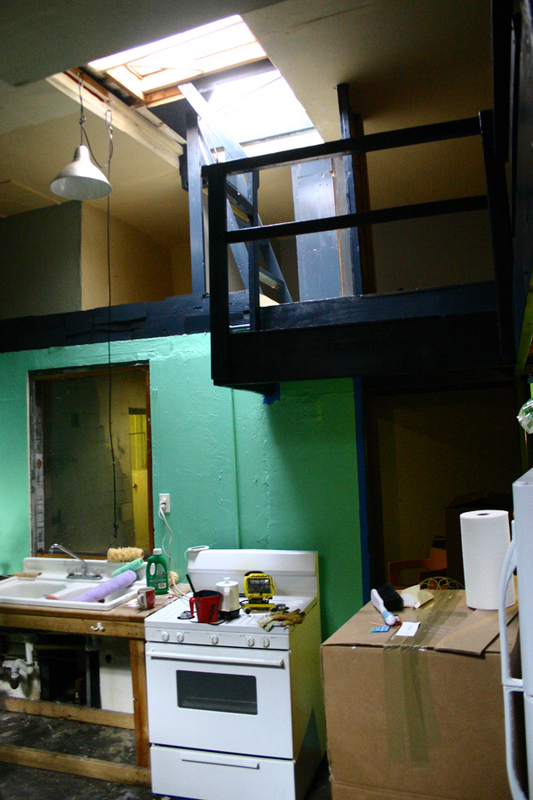 Between visits from plumbers and roofers, in that first week in the freezing garage, we managed to paint most of the walls, tear up some bad flooring in the bathrooms, and break away cement around the tub and then tile it. When my mother left at the end of the week, I can’t begin to express how lonely I suddenly felt because no matter how bad something is when a parent is around, and no matter how old you are, you still subconsciously know that they will make it all okay. Though she assured us that everything would, indeed, be okay, she also informed me that she literally cheered when she crossed the bridge out of Brooklyn. 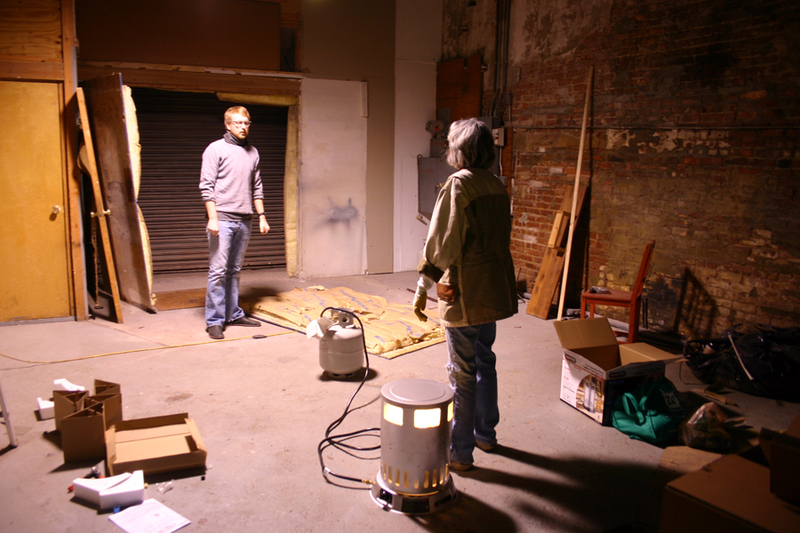 Here are some pics from the first week in the space. Before we had real heat, we stood by a gas fire for warmth. They were still smiling then. 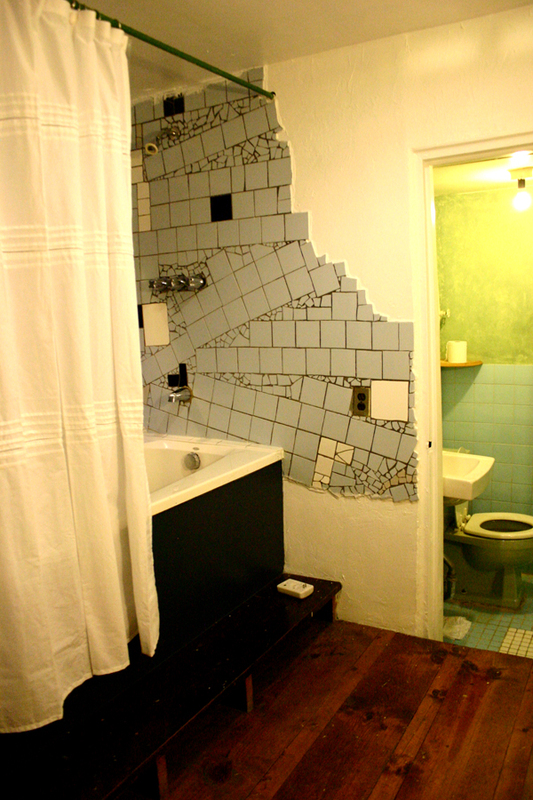 Joan plastered the wall and tiled around the tub. 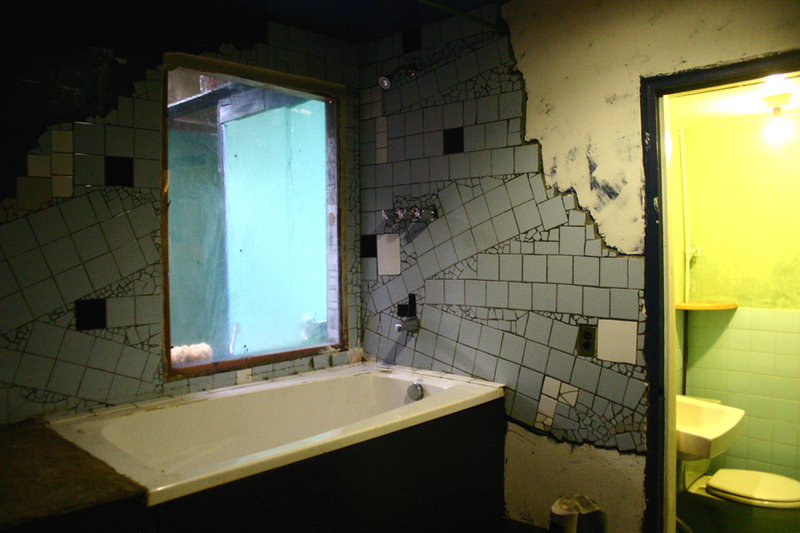 After painting, we liked how the bathroom was starting to look like a Russian spa! 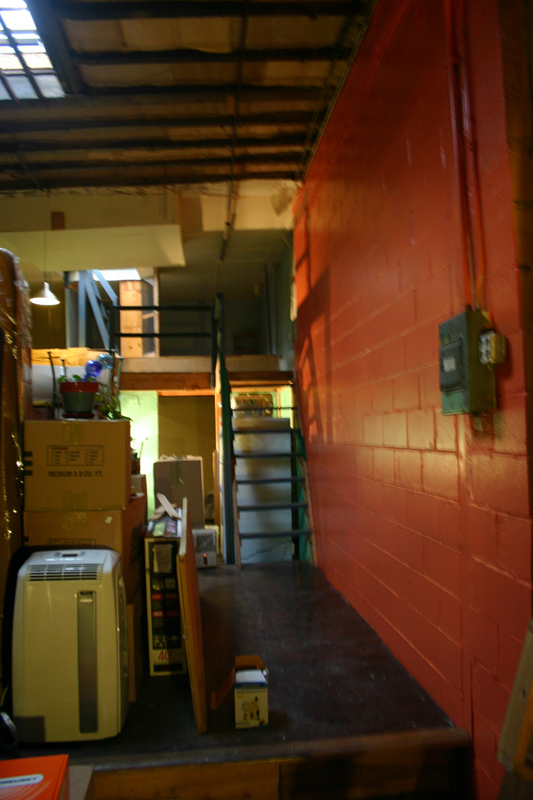 This orange wall was my first project. I knew it would go fast and I really needed some immediate payoff. 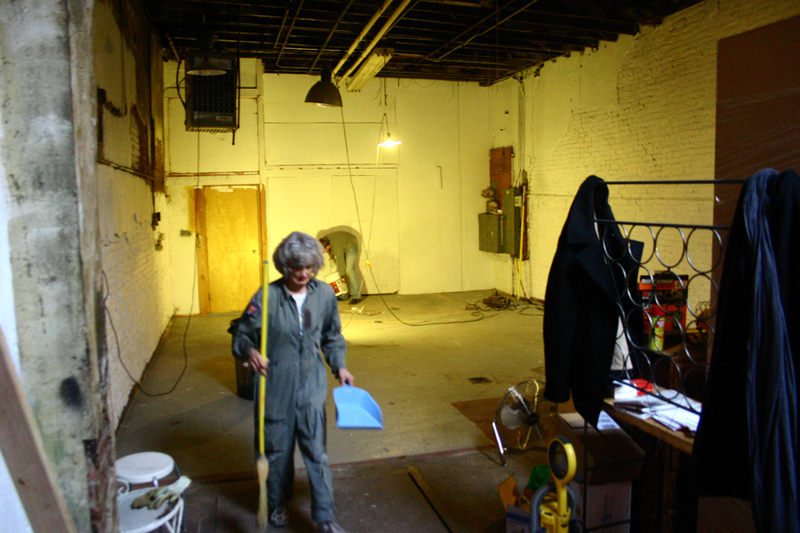 The white walls really transformed the space, and isn't my mother cute in that old flight suit?! When the plumber wouldn't come, Jeff tried himself, with Joan's and my MANY suggestions. That was ambitious, but I can’t wait to see how it all turns out. I’m on the edge of my seat!